According to the Consumer Product Safety Commission, over 200,000 injuries occur each year on playgrounds. When your send your little learner off to day care, there is an expectation that she is safe and sound both inside and outside. Playground safety for licensed child care centers is a key issue in maintaining a healthy environment in which kids will grow. Although the specific requirements for outdoor equipment may vary by licensing agency or state, all licensed child care centers are subject to rules that govern playground spaces. Qualifying for, or maintaining, a child care license means that the regulatory agency -- whether it is the state department of public welfare, child services or another similar body -- must inspect the center to ensure that it meets safety standards. This includes the actual center itself as well as outdoor areas like playgrounds. While some licensing agencies send out their own inspectors, others may ask that the centers schedule and submit their own inspection from a qualified professional who can assess the quality and safety of the equipment and the play area. For example, the Michigan Department of Human Services requires licensed centers to document playground safety with an inspection done by a certified playground safety inspector. The CPSI must have approval from the Michigan's Bureau of Children and Adult Licensing, Division of Child Care Licensing. The U.S. CPSC issues national standards for playground safety in public places such as parks and child care centers. According to the CPSC, the guidelines are known as the "standard of care" to which professionals should adhere. 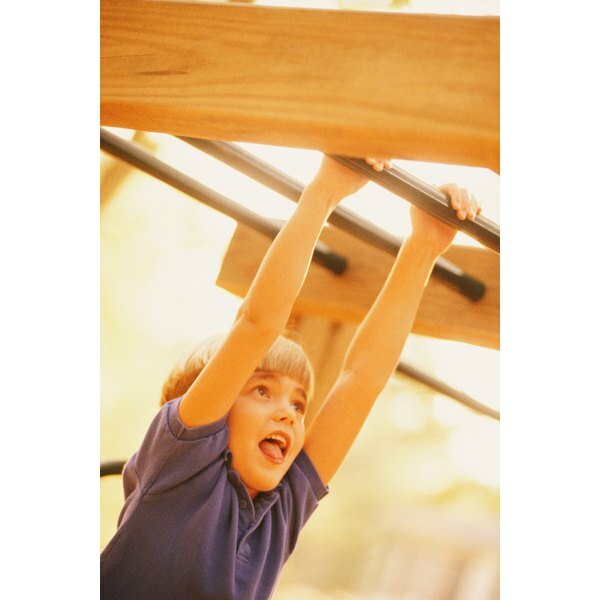 The CPSC standards include categories for inspection, routine maintenance, repairs and parts of equipment -- such as platforms, protective barriers, ramps, stairs, ladders, merry-go-rounds, seesaws, slides and swings -- as well as overall playground layout, hazards, hardware and building materials -- such as metals or woods -- that make up the equipment. Although there is no debate that equipment safety is crucial when it comes to reducing the risk of accidents on a child care center playground, adequate adult supervision is equally as important. The CPSC recommends, in its guidelines for public playgrounds, that children have professional supervision at all times when on center-based equipment. Additionally, supervisors should also maintain a watchful eye on the equipment itself, regularly checking it for unsafe or broken pieces. The specific number of adults per children that a licensed center must provide may vary by state or local licensing agency. This will typically follow the same standards for adult-child ratios that the licensing agency requires for indoor activities. For example, the South Dakota Department of Social Services requires a 1:5 ratio for toddlers and a 1:10 ratio for preschoolers. Licensing standards for child care center playgrounds typically include guidelines for the types of equipment that a site can install. The specific types of playground equipment that a center uses will vary by licensing agency and may also differ depending on the ages of the children. For example, licensed centers in Maryland must maintain safety standards on the playground by following the state's guidelines for developmentally appropriate play equipment. Maryland's guidelines break down equipment by age and include items such as ramps, stairways, slides and climbing equipment under 32 inches for toddlers and straight slides, climbers, merry-go rounds, rung ladders and stairways for kids in preschool. Additionally, licensing regulations may require centers to use, or restrict use of, equipment made with certain materials such as metal, wood or specific paints.